D*Face is a London-based sculptor and stencil artist, who uses the city as his own personal gallery sticking, pasting and drawing on any wall or space available. Known for its subversive nature, his work challenges our expectations by overturning iconic imagery and introducing us to his own bizarre characters and creations. Growing up in London, D*Face had a childhood interest in graffiti, and as a teenager was drawn to the street culture and imagery associated with skateboarding. Following a degree in Illustration and Design, D*Face went to work at creative agency, but was disillusioned with it and continued to pursue his own work on the side. Eventually his personal work eclipsed his paid work and he left his job to concentrate on his artistic ambitions. 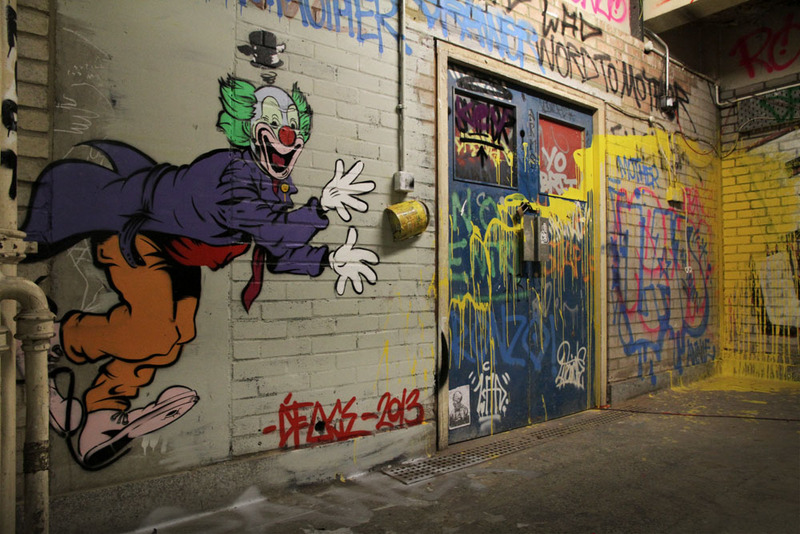 His characters, such as "D*Dog" are vehicles for which the viewer questions their relationship with the work, it aims to encourage the public to not just see but to look at their surroundings. An associate of Banksy, he has shown works at the world famous Santa's Ghetto and recently had his own solo exhibition at the Stolen Space gallery in East London.